We’re kicking off the New Year on Kilimanjaro! The Lemosho Traverse remains to be the ultimate way to experience this spectacular mountain. Husband and wife team Tim and Terri and their friend Rafael will travel through the forests, across the unspoiled Shira Plateau, and then up the Barranco Wall before they broach the crater rim where they will spend a night at 18,700 feet. 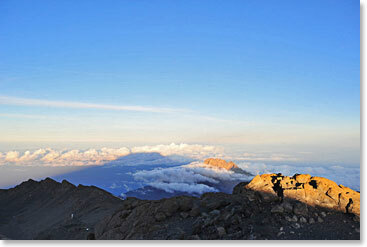 As one of the Seven Summits, Kilimanjaro is the highest peak on the African Continent and it stands at 19,340ft/5895m. This trek gives the climber a first-hand view of all the distinctive aspects of Africa’s greatest mountain. From the alpine desert all the way to the giant glaciers inside the crater. Join us as we send day to day dispatches from this treasured adventure. January 30, 2012 – Summit Success on Kilimanjaro!